Hope the winter hasn't gotten to you and you've still got lots to smile about. It's cold here this week - negative somethings Fahrenheit. But at least the sun's out, and no one has head lice. Yes, I have low expectations in the winter; I have to pace myself till spring and peaking too early with, say, a random outburst of exuberance might be courting disaster. Stiff upper lip, LiEr - that's the way to survive trials and adversity. I thought I'd take some time between actual tutorials to respond to some of the comments you've left. I took most of the photos as far back as a year ago, and I might have forgotten important things I'd wanted to illustrate, or else misinterpreted photos because they no longer look familiar and I can't remember why I took shots of those angles in the first place. So if you think that something's unclear or contradictory or just plain weird, feel free to leave more comments or ask questions about the tutorials or posts, okay? A couple of you asked why I chose to sew the lining and outer layers as two separate pouches connected only at the zipper. After all, there exists (and they've used) a method that allows both layers to be sewn together at the seams so that they cannot be pulled apart in the finished product. The advantage of this method is that the lining stays put, being anchored at the main seams and not just at the zipper. Here is a link that one commenter (thank you, diario de naii!) shared to her tutorial demonstrating that method. If you've never tried it, it's a good thing to learn! The sew-all-seams together is a brilliant method. It connects both layers first at the zipper, and then also along the main seams. In pouches made in lightweight fabrics, in particular, it is very useful and elegant. Anyway, over the years of sewing heavy-duty bags, I developed my construction sequences to minimize bulk in their seams. Sewing the outer and lining layers as separate, individual bags/pouches allowed me to work with only one set of of SA per layer, which I could press open and then have lie flat against the corresponding SA of the other layer(s) - much less bulk this way, and flatter seams and sharper edges. And since then, I've almost exclusively used that method for no other reason than my brain being on status quo mode, even during the rare instances when I'm sewing with lightweight fabrics. almost always stabilize my lining layers with sew-in interfacing. That extra support gives the lining fabric a sturdy structure so that it sits squarely and holds its own shape within the outer bag/pouch. where possible, use a heavier fabric i.e. at least a home-dec weight, for the lining (and still stabilize it with sew-in interfacing). sometimes sew the SAs of the lining and outer layers together on the WS of the project before turning everything RS out. This technique is identical in concept to the sew-all-seams-together method in the above link, except that the seams are still sewn separately, with only their SA sewn together on their WS in the last stage. If you've made a garment (e.g. a skirt) with a lining, and sewn the SA of the lining to the SA of the outer skirt at the end of the project to prevent the lining from riding up during wear, you'll know what I'm talking about. 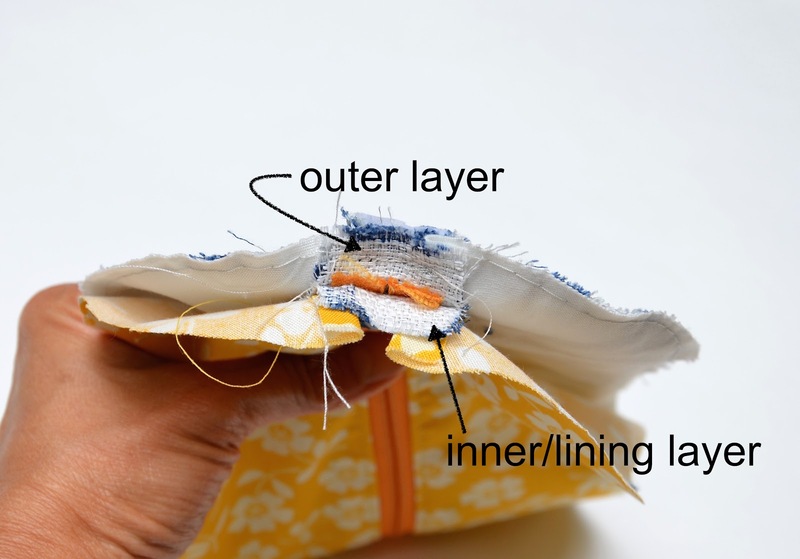 I haven't taken the time to visualize how that sew-all-seams-together technique might work in bags of more complex construction - for instance, backpacks with zippered gussets, in which the gusset is attached as a loop to the front and back panels. I certainly have never tried it myself. It could be that it is still easily done, or it could be that it no longer works with the additional seams involved. If anyone has done that, please share a link to your tutorial so we can all learn. I, personally, am very curious, and excited to learn more! I've received some requests to post a supply list of materials and zipper specs, because some of you are interested in sewing along with this series. I am thrilled that you're doing a real-time sew-along with me! I am happy to share some of the materials I've used for each bag/pouch, for shopping purposes. Unfortunately, I am not planning to document the dimensions of the pieces, or even the zippers. I do not mean to be secretive - it is just that I'd drafted the dimensions of my pouches and bags based on the lengths or sizes of zippers I'd found in my stash at the time. Also, I drafted most of the bags/pouches of the series a year ago, and don't remember the dimensions of each piece. Worse: I don't save the templates. In general, I buy my zippers in person from fabric stores (JoAnn, SR Harris, and Textile Center in Singapore). These zippers, particularly the chunkier ones not usually used for garments, come in certain lengths only. Common lengths are 4" (good for small bag pockets), 7" and 9" (good for pouch openings and medium pockets), 14"- 16" (good for main openings/front panels of bags, and zippered straps). 22"- 36" are good for gussets (think backpacks and suitcases). My suggestion is to draft your bag first, based on the size of an existing bag that you know works for your body/height. Then, understanding the standard lengths of zippers available, browse etsy shops for "bag zippers" in the lengths you need for your draft. Pick whatever comes in the length and color you need -it's always better to buy a little longer (and cut the excess off) than too short. Other places to shop for zippers include zipper manufacturer websites, sewing supply stores or suppliers of outdoor sports materials e.g. marine upholstery stores (especially useful for the heavier-duty and/or longer zippers). My aim is this: at the end of the series, you'll be able to look at a zippered bag and feel confident that if you made that bag at home, you could install its zipper(s). If I achieve that, I'll be thrilled. But my secret other aim is for you to design your own bags with zipper features - whether it be something as simple as adding additional zippered pockets and compartments to a basic tote, modifying a zipperless pattern to include a zippered opening, or creating a brand new bag that morphs into something unexpected and novel (and useful). Either way, I hope to take away some of the roadblocks - the "I can't"s and the "I don't know how"s - that often frighten you away from even beginning a project with a zipper in it. You guys know how to sew - you know this and I know this - and I want you to feel confident and excited, to see possibilities, not limitations. So onward, then! I know we've been making boring pouch after boring pouch so far, and some of you might be antsy for the actual bags. We'll get to them, I promise! Totally agree with your arguments, that technique (sew-all-SA) is not good for heavy fabrics. My doubt was because I don't see too much of this construction in pinterest tutorials, and I think it's a good way to have both pouches with the same size. And I can't see the thing 3, :))))), maybe my brain is too tired now. Anyway, I'm anxious to see the advanced part of the series! Love reading you, you are so funny :)))) and a awesome seamstress! I live far from the stores that sell the zippers, so I can understand the folks who want a list of what's coming. I stopped at Walmart and bought a couple of plastic zippers in different colors, hoping that would give me a jump start -- then the next bag you posted was the one that used TWO zippers! I'll have to wait for my next trip into town to try that one out. Since you started posting, I've made three zippered bags. They've each got their own problems, but I'm getting better each time. It doesn't help that my daughter (the one who made the amazing dress out of Walmart sheets that I showed you a while back) doesn't see what the big deal is. Is there any reason not to use invisible zippers for lightweight zipper bags made from quilting cotton? A local shop has them for half the price of what the box stores are charging and since I'm just experimenting with scrap fabric at this point, it would be nice to keep my costs down. Michelle: No reason to not use any particular kind of zipper for any project, really. That said, invisible zippers are installed differently than regular zippers, because their coils are on the "WS" of the zipper tape. You can still face them in fully-lined projects - think lined skirts and lined shift dresses - but the construction sequence will be different. Thank you so much for doing these tutorials. Your instructions and photos make it very easy to understand each step - not just what to do - by why to do it that way. I thought the septum was the bit in the nose dividing the nostrils?